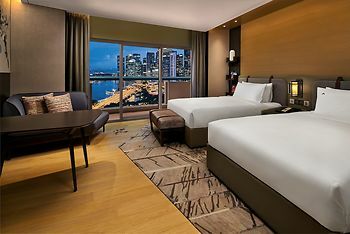 Swissotel The Stamford is a leading business hotel in Singapore and one of the tallest in Southeast Asia. This luxury five-star venue affords easy access to many of the city’s major attractions and is close to Changi International Airport. The landscape view was greate. The mini-bar was empty and the hotel do not want to use it anymore, it would be a better hotel if you let the guests use it freely. Great location with easy access to public transport. Staff were helpful and accommodating with all requests. The view from the room was fabulous! The location was good. Very convenient. Harbour View is excellent. The view from the hotel room ^^ but i only get 38th floor with city view. also the location is perfectly near to every city corner. After travelling for 13 hours from London I arrived at the Hotel at 9 am. The staff were able to have a room available to me at 11 am instead of 2 pm. I was issued with a key to the "hospitality room" where I was able to have a shower and relax in comfort until my room was ready. The next day I was given a late check out of 2 pm instead of 11 am and was able to use the "Hospitality Room" until I left at 5 pm for the airport. On both occasions my luggage was kept in safe keeping until required. I was extremely impressed by the excellent service by all staff members and the Hotel's facilities and would not hesitate to stay there again. The helpful, friendly staff and the convenient location.Very good in house restaurants. Generally vey consistent service. The carpert in my room was very "tired looking".I stayed in a room in the 600 number range approx. 14 months ago and this section of the hotel has obviously been renovated. In the number 300 range is it yet to be renovated? There was something hanging from the ceiling,flapping plastic has been used to cover it ,just past my room in the passage way. Not typical of the Swissotel. When showering, it became apparent that the drain was blocked. This was promptly fixed by maintence when I reported it.However it was not nice having 2 showers with water midway up your legs. Proximity of MRT and that rooms were serviced immaculately. Logos, brands, and other trademarks featured within this site are the property of their respective trademark holders. These trademark holders are not directly affiliated with Hotelsone. Swissotel is a registered trademark.© 2001 - 2019 HotelsOne. All rights reserved.